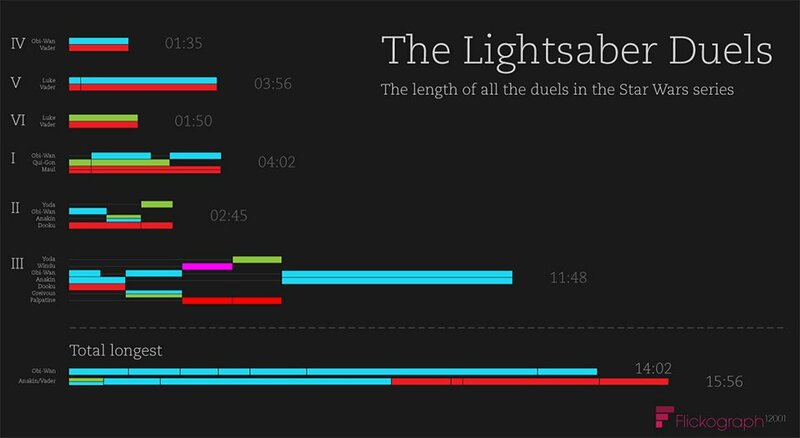 This Flickographic by Matt Isherwood displays the length of each lightsaber duel in the Star Wars films. Beginning with the first duel seen on screen, Obi-Wan Kenobi fighting Darth Vader in Episode IV, with a duration of 1:35 through Luke Skywalker against Darth Vader in Episode V and on to the longest lightsaber fight of all, with Yoda, Windu, Obi-Wan Kenobi, Anakin Skywalker, Count Dooku, General Grievous, and Supreme Chancellor Palpatine in Episode III which comes in at a sweat-inducing 11:48. As the lightsaber battles progressed through the films they got longer, but they seemed get less believable and more poorly choreographed.